As others have noted, this album occupies a unique place in the Bill Evans discography. It's the only album to document drummer Jack deJohnette's too-short stay in the trio. The trio's performance on this album won them the 1969 Grammy for Best Jazz Instrumental Album, Individual or Group. By the time this set was recorded, live in Montreux on June 15, 1968, Eddie Gomez and Evans had been playing together for two years. Gomez provided a different brand of virtuosity to that offered by Scott LaFaro in Evans's classic trio of five years earlier but he was clearly the best bass player Evans had worked with since LaFaro's tragic death. The groove between the two was deep and comfortable, so comfortable that in this set, Evans did something he hadn't done before, at least on a recording: he showcased Gomez for an entire piece, the almost seven minute long "Embraceable You." 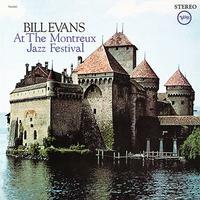 As the liner notes by Gene Lees reveal, Evan's performance at the renowned jazz festival in the nightclub of the Montreux Casino, one of the most fashionable resorts in Switzerland, was one of his best. He and Gomez played with more exuberance, more happiness and more drive. Evans' brooding, introspective musical side has been represented well on records before; the bright side has been too-little heard, but it's here in this album. At the end of each number the audience exploded in applause so stormy and extended that it had to be heavily edited for the album. Enjoy this sparkling Bill Evans piano performance, made sweeter by the expert mastering by Bernie Grundman from the original analog tape. For this edition only the best vinyl pressing would do — a 200-gram super-silent luxurious-sounding platter from Quality Record Pressings, makers of the world's finest-sounding LPs. First-rate and top-notch, this album will make a superb addition to your record collection.